Galvanizing has been an effective, maintenance-free, environmentally-safe corrosion control solution for over 150 years. We specialize in custom hot-dip galvanizing solutions, especially for companies that have an ongoing need for galvanizing aesthetically done and delivered on time. From design assistance for the best and most economical zinc coverage to meeting your individual needs for anything from special packaging to product preparation for easier assembly, you can count on Ohio Galvanizing to get your job done on time, and on budget. We are experienced galvanizers who take pride in DWWSWWD - Doing What We Say We Will Do. Give us a call and let us help you with your galvanizing needs. 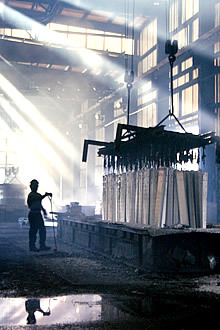 Ohio Galvanizing will get your job done right!